The Mare and Foal sculpture by Gabriel Sterk in Elizabeth Park, Scone. 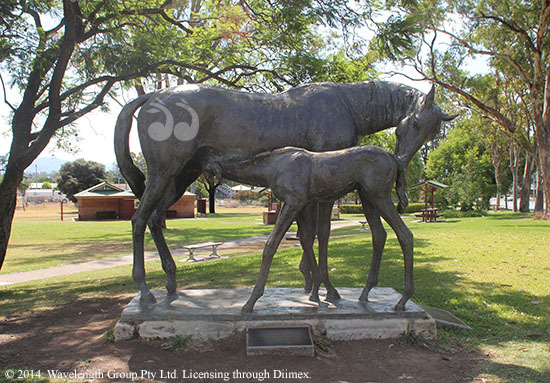 Elizabeth Park is well known for the beautiful bronze sculpture of Scone Mare and Foal by Gabriel Sterk. It is probably the most photographed mare and foal in Australia; everyday children and adults alike climb on for a photo. The Park is a popular place for people traveling on the New England Highway to stop and have a break, with plenty of picnic tables, shade and play equipment for children. Elizabeth Park is opposite the Scone Tourist Information Centre, the Scone Railway Station and is a short walk to grab a coffee and food from nearby cafes. Elizabeth Park was originally known as Railway Park, which was created from vacant land near the Scone Railway Station; the railway reached Scone in 1871. Elizabeth Park in the 1960s, with a fountain donated by William Bishop. Image courtesy of Scone and Upper Hunter Historical Society. In 1953 the Scone and District Country Women’s Association asked that the Park be renamed to Queen’s Park, to commemorate the Coronation of Queen Elizabeth II, but the Council decided on Elizabeth Park instead. The Park had been vacant land until after the Second World War when Council provided children’s play equipment of swings, a sandpit and a slide in 1948. That same year carols by candlelight was first held at Elizabeth Park, a tradition that continued for decades, until they moved to Scone’s aged care facility, Strathearn, in 1992. 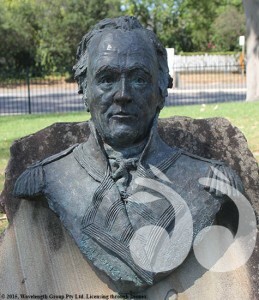 Bust of Governor John Hunter in Elizabeth Park, Scone. 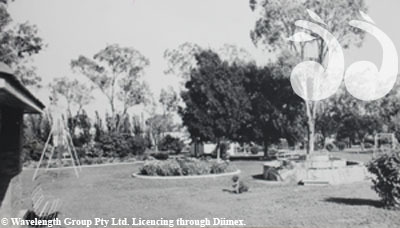 The Scone Rotary Club supported many local Parks and in 1951 paid for Elizabeth Park to be top dressed and laid a concrete path. In 1956 a fountain was donated by Councillor William Bishop, which has since been removed from the Park. Between 1966 and 1973, Elizabeth Park was awarded the prize for the Sydney Morning Herald’s Garden Competition every year, under the green thumb of Council’s gardener Bramley and his team. The Scone Mare and Foal bronze sculpture by Gabriel Sterk was unveiled in 1982. In March 1994 a bronze bust of Governor Hunter was added to Elizabeth Park. Audrey M. Entwisle, “Scone Shire, A Centenary History of Local Government”, 1988. Copies are available at the Scone and Upper Hunter Historical Society. the Scone and Upper Hunter Historical Society for their assistance.